For almost 20 years I have hiked the section of a trail depicted in this photo. It has never been rutted like this in all those years. 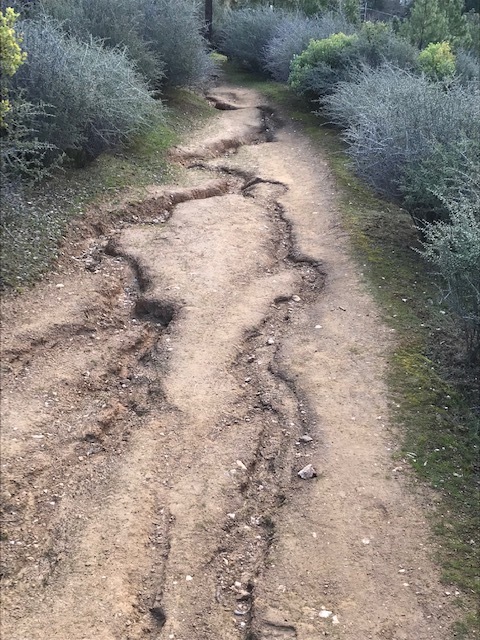 A combination of weather events, poor trail maintenance and just life in the wild produced these deep ruts. The beginning and the end of the trail are smooth and easy to hike. It was just this part of the trail that was damaged and challenging to negotiate. The photo of the trail depicts the realities of life. Some sections are smooth and appear to be well maintained. Other sections are rutted with sorrow, personal failure or the poor choices made by other people that can affect us in a negative way. These ruts are not the definition of the entirety of our life. They are only seasons of time we need to walk through to get to the smooth part of the journey that is always present if we choose to keep moving forward with hope in our heart. If you are going through a rough patch of life it is important to understand this is not your forever trail or some form of punishment. It is simply part of life. Life washes out. It has ruts and potholes. When you come to a rough patch, hold on to your faith and most importantly hold on to your love for God and people. Love will always win and your trail will eventually smooth out.